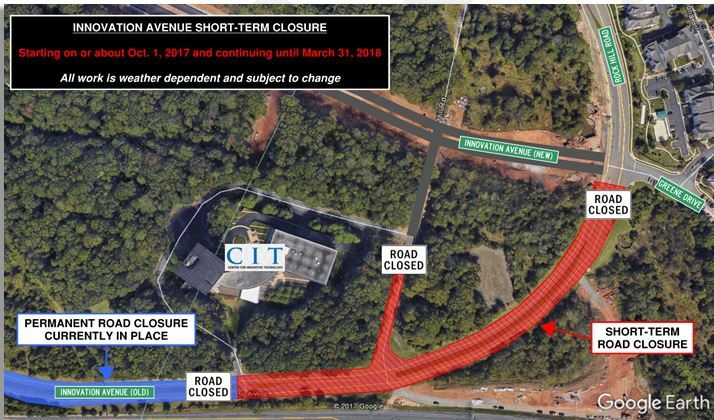 On or about Sunday, Oct. 1, the old Innovation Avenue alignment southeast of the Center for Innovative Technology (CIT) building will temporarily close between Greene Drive and the currently-closed section of old Innovation Avenue. The closure will be in place throughout the fall and winter months to accommodate Silver Line Phase 2 utility and road construction work. All residences and businesses, including the CIT building, will remain accessible from the new Innovation Avenue alignment and Rock Hill Road.